When it comes to event planning, one aspect that you want to make sure you get right is the food spread. Whether it’s a corporate lunch, a week-long business conference, a glamorous wedding reception, or even a graduation celebration, you want to make sure that your guests are satisfied and nourished. In fact, the food offerings might even be a deciding factor as to whether people judge your event as a success or something more “meh.” The food might even help them decide whether or not they’ll come at all! So in order to help your event go off without any hiccups, you need someone who is going to be able to provide not just a wide assortment of food, but also fresh, delicious food. With all of the other things you have to juggle prior to, and during, the event, there’s just no way that you can dedicate the proper time to the spread. And nobody wants grocery store sandwiches and off-brand chips, after all. That’s why you need the employ professional catering services to come to the rescue. At Etai’s Catering, we help make your event a memorable one with our delicious, fresh, and healthy Denver catering services. We’ve been doing this since 1994, catering events big and small and everything in between. 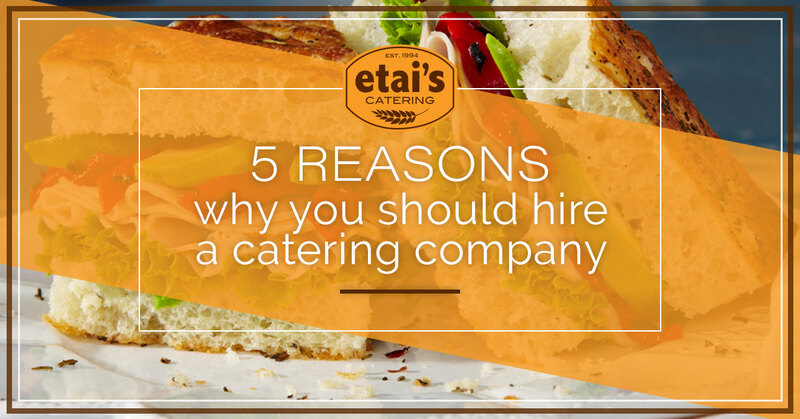 With that being said, here are five reasons why you need to hire a catering company for your next event. Planning an event is stressful and time-consuming, as you well know by now. Save big on both of them when you hire professional catering services to take care of one of the most important aspects. Your chosen caterer will organize the menu, plan and prepare the food, and deliver it straight to your event — fully stocked with all of the fixings and other necessary items. Hiring a caterer allows you to tackle a large chunk of your “to-do” list without much effort at all. Now with Etai’s Catering in Denver, you can even place your catering order online to save even more time! Professional caterers, like Etai’s in Denver, have a wide assortment of menu items and options to help satisfy just about every taste bud at your event. This eliminates the need to limit your offerings to a bland, dull selection. Whether you want gluten-free pastries, fresh and healthy salads, or delicious sandwiches made with freshly baked artisan bread, our professional catering services have you covered! Like we touched on earlier, when you’re planning an event there’s a good chance that your attention will be scattered all over the place. Our local Denver catering services won’t allow the quality of your event’s food to suffer as a result. Our team will take care of all of the small details, from the quality of our fresh foods to the presentation to the beverage availability and a whole lot more. You run your event. We make delicious food. It’s just what we do. 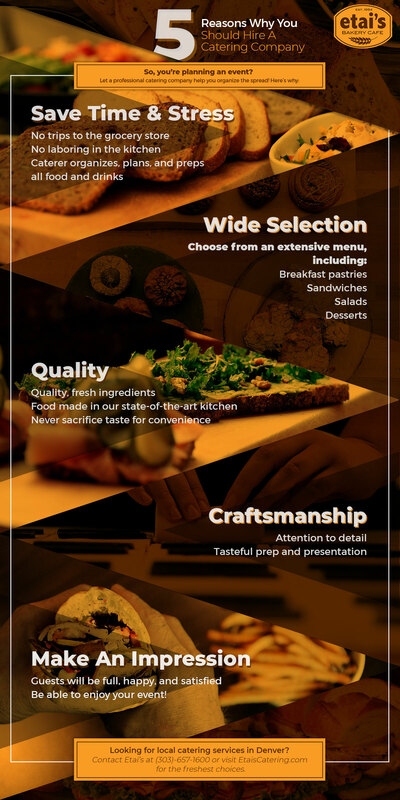 When you hire our professional catering services, you know you are getting quality, fresh food that is handmade in our state-of-the-art kitchens. You wouldn’t hire an electrician to cut your hair — so why would you hire anyone other than a professional caterer to craft the perfect spread for your event? These could be real quotes that you’ll overhear during and after your event. That is, when you choose the right caterer for the job. Guests are sure to be impressed by someone who takes the time to carefully plan every intricate detail of their event. Make a lasting impression by choosing Etai’s Catering in Denver. Give us a call or place an order online today!